Cons: EPU plugs could have better placement. Pros: Very expandable. Onboard power switch. This Mobo gave me no issues on installation. Plug and play at it's finest. The Onboard power switch seemed like a useless feature, but became quite handy for testing before installing. No wonder I enjoy ASUS products. Build a rock-solid foundation with the ASUS M5A99FX Pro R2.0 Socket AM3+ Motherboard. 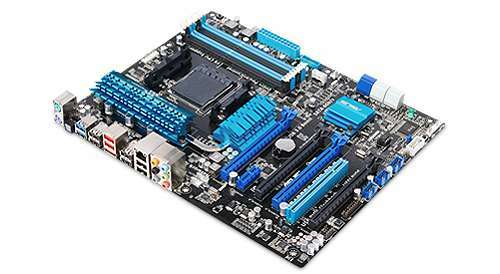 This motherboard lets you install powerful processors like Athlon II, Phenom II, and Sempron II with its AM3+ Socket. Plus, its four DDR3 slots can accommodate up to 32GB memory, delivering up to 2133MHz (O.C.) memory speed for lag-free computing operations even on intense environments. Enjoy smooth, ultra-fast data transfer rates with its USB 3.0 ports, SATA III interface, and PCIe 2.0 x16 slots. Furthermore, it comes with a Realtek� 8111F, 1 x Gigabit LAN Controller to let you access the web at incredible speeds. 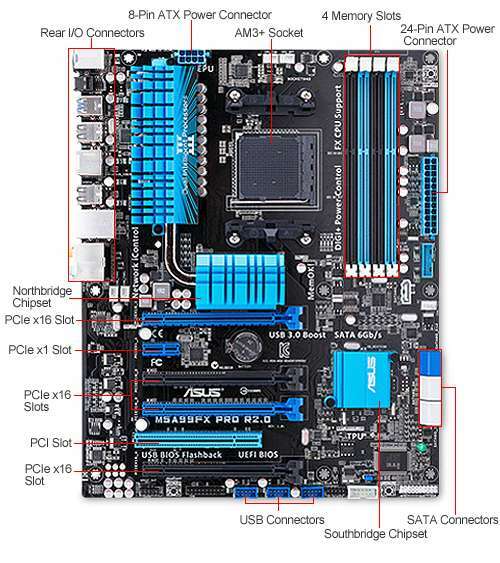 For top-notch performance, this motherboard is equipped with innovative technologies like the USB 3.0 Boost for faster USB 3.0 transmission with UASP; CrossFireX Ready for immersive virtual environment; Windows 8 Ready for next-generation computing experience; and Network iControl to prevent network congestion and long-waits on downloads. Integrate powerful components in a single unit with the ASUS M5A99FX Pro R2.0 Socket AM3+ Motherboard, purchase it now! Features Dual Intelligent Processors 3 with New DIGI+ Power Control - Full Hardware Control. Total Performance Tuning.